Take a bow Mr Whalley. Having previously spent significant sums on day courses and books on Photoshop, I still had no real idea how to set about enhancing my photos. His short book has taught me a methodical approach to image adjustment, so I can now improve contrast, change colour saturation, pick the correct tool to eliminate artefacts and use layers. His clear and concise text, aided by examples that you can work through, explains in simple terms, how techniques such as layer masks, sharpening, and curves are modifying the picture, and how they may best be used. In a few short chapters he has reduced this huge and complex program into one that I have confidently started to use on my own photos with dramatic benefits. It has also given me the fundamentals on which I can build when using those expensive books. How confident are you in using Photoshop? Are you able to look at a photograph and immediately know the steps you will go through to improve it? Can you navigate the Photoshop interface easily to find the tools and features you need to use? Do you have the skills to reveal the hidden beauty of your photographs and literally transform them? If you can’t answer with a yes to these questions then this book could hold all the information you need to become proficient with Photoshop. It can be applied to any version of Photoshop released since the year 2000 so you can be confident that you will gain value even if you are still using Photoshop 6. If you use Adobe Photoshop Elements do not buy this book as it will not apply. Equally, if you are an expert with Photoshop this book isn't right for you. This book is designed to take photographers from Beginner to Intermediate level with Photoshop. Photoshop is a superb tool for photographers wishing to enhance their images. Unfortunately, it’s a huge, complex application with a very steep learning curve. Think of any change you might want to make to an image and there will be many different adjustments you could use; some will be good but others could be ill-advised. There are also different approaches to working with images; the best will be non-destructive whilst others could find you repeating changes if you need to start over. 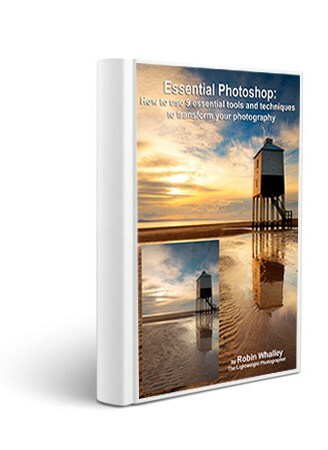 This book explains how to work in the right way with the essential Photoshop tools. You will gain confidence that you are working with your images using a recommended and professional approach. When I started using Photoshop some 13 years ago I dreamed of a guide that would take me through the essentials and fit everything together into a simple system. All the popular books at the time assumed existing knowledge or were very complex and difficult to understand. Even today I believe this gap exists so I decided to fill it. By following this book you will learn a complete workflow that can be applied to every image you want to improve. We won’t cover every aspect of Photoshop as you don’t need much of what’s there. You do, however, need to know how to use a number of essential adjustments and how to work in a non-destructive way. This book will take you through everything you need to know and provides you with a firm foundation in image editing from which you can progress to more advanced techniques. We will cover how to work effectively with Color Spaces, Layers and Masks. Check that your adjustments are not pushing your image colours out of Gamut and what to do if you detect this. You will learn simple techniques to add, copy and remove elements of an image seamlessly. And, of course, you will learn how to literally transform your images in the same way as the example on the cover of the book. The book contains at least one worked example for each of the tools explained and you can download the supporting files from my website in order to follow along on your own computer. In addition to downloading the starting images for the examples you will find these files contain the very adjustments I made in order to illustrate the book. This book is packed with advice, techniques and examples to ensure you have all the tools and knowledge needed to work effectively with Photoshop. Download the sample now to check the contents and see just how accessible this book is.